FOR ALL AGES - Xtimer 3x3 Speed Cube, to increase the intelligence of the kids, to release the working pressure of the adults, to help prevent a decline in memory of the elderly. Suitable for beginner and professional player. Enjoy hours of fun with you family and friends. ERGONOMIC DESIGN - Axle Cross Using High Strength PA Plastic, 6 Axis Adjustable Spring Design, Good Pressure and Anti-fall, Great Choice for Pros in Cube Competitions. Eco-friendly Product- Recyclable Material, Harmless to Human and Environment, no need to Replace the Stickers - 6 Solid Colored Plastics, No Stickers. EXCELLENT STABILITY - Great corner cutting ,Tension adjustable. It doesn\'t corner twist as often nor does it lock up. Difficult to pop, good control of the cube, comes pre-lubricated and tensioned. Definitely a good choice for you to improve personal record in competitions. 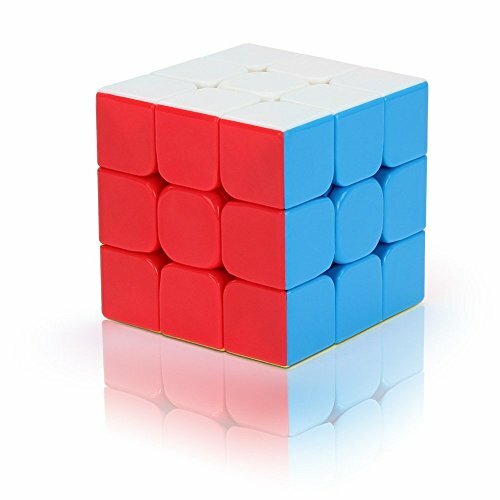 This cube can be used for international competitions. CHALLENGING & FUN - It is a classic color-matching puzzle in which the color shift making it look like a mess, but once you solve it, it magically becomes perfect cube again. Improved Anti-pop Technology and Structure for Extremely Fast and Smooth Cornering. ULTIMATE GIFT IDEA - No one falls out of love with the 3x3 cubes. Perfect Christmas Gift / Birthday Gift. This classic puzzle game will never go out of style .